Christchurch Borough Council: Pure Town Planning is delighted to have assisted in securing a planning consent for the erection of a 4 bedroom, 2 storey detached dwelling with associated parking in the Highcliffe area of Christchurch. 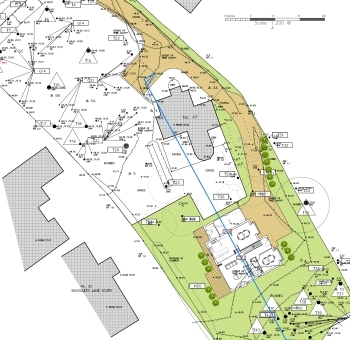 The proposal was designed and submitted by Anders Roberts Cheer architects and involved splitting the existing large plot to form a dwelling at the rear of the site on the existing large garden. Whilst the Christchurch Borough Council planning officer’s recommendation was to grant approval, the application was red carded by a ward councillor on the basis of concerns relating to density, flooding, privacy and cumulative impact on neighbouring properties. At this stage, the applicants contacted us in order to represent them at Christchurch Planning Committee and to put forth the merits of the application to the planning board. We subsequently analysed the application and the respective concerns of the ward councillor in detail and prepared our deputation to systematically address her concerns. Despite some initial doubts from members of the committee (including a move to refuse being tabled and subsequently failing), following our deputation the Council members had further debate and eventually voted in favour of supporting the application for approval. The scheme was granted planning permission and the applicants who were in the audience were delighted (if not relieved it was all over – planning committees can be stressful when there is a lot riding on it!). If you have an application which is being brought before planning committee, why not contact Pure Town Planning for a free consultation on how we could assist in representing your application.